Reading activity is something that can never be separated from our daily lives, especially for students who are required to always read in order to add insight, both for assignments or revisions. In this millennial era there are very rare activities in reading books, going to the library and reading physical books. Very impressive if it keeps happening. To develop the spirit of reading and adding interest in reading among students, the Atma Jaya University Library, Yogyakarta, provides a place to complement students' reading interest. This reading place is commonly known by students with the term corner, if we contextualize with the reading and library fields, this corner means "reading corner". Atma Jaya University has 5 corners, including India Corner, Chinese Corner, BI Corner, KPK Corner, and also Atma Jaya Corner. These five corners have different benefits, data sources, information and knowledge. For example, Chinese Corner and India Corner have similarities about discussing history, culture, customs and other knowledge that is useful for students who are interested in the Corner object. BI Corner, this reading corner provides information regarding how economic development in Indonesia. BI Corner is very useful for students of the economics faculty. KPK Corner is a reading corner that provides all knowledge about corruption and also provides insight for students to become young people who understand corruption, starting from cases and how to fight it. Aside from being an information medium, this corner is also used as a medium of communication between the university and the KPK (Corruption Eradication Commission). And the last is Atma Jaya Corner, this corner is a corner of Atma Jaya University itself, and certainly contains everything related to the University of Atma Jaya Yogyakarta, including history, vision, mission, motto, philosophy, and many others. One way to attract students to take advantage of the corner, the University, especially the library, always held ivents, for example for what had been done in the past, namely cutting paper, calligraphy, and some dance performances from Chinese and Indian cultures. Some of the events were a form of institutional concern for students in introducing outside culture. Besides this corner is also a real form of a good collaboration between university institutions, faculties, and the corner parties. 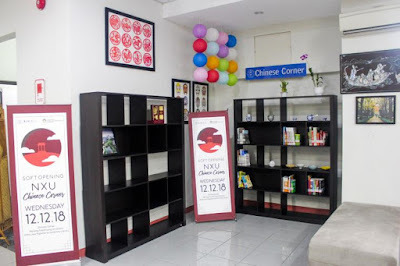 With the existence of this Corner, it is expected that students will further increase their reading interest and also their interest in learning new things.